From NPR: Struggling Gateway computer is being purchased for $710 million by Acer, a Taiwan-based computer maker. Gateway was a rising power in the computer industry in the early 1990s. It was started by college dropout Ted Waite in his father’s South Dakota barn back in 1985.” Story here. I always find the careful selection of the perfect gift far more satisfying than receiving goodies. Ok, that’s not always true but picking a good gift for someone is always a victory. 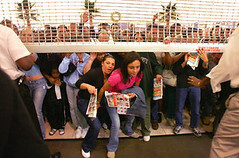 Black Friday is not about careful shopping. Instead, you wake up early on the day after Thanksgiving (Friday), eat leftovers for breakfast, and line up in front of your favorite big box retailer. The doors open and you flood in with the rest of the mob in search of a $19.99 DVD player for grandma. The origin of the term Black Friday is murky. It either refers to the stress of the day, both on customers and overworked sales staff, or the hope that the day puts a company in the black (accounting term – negative numbers show as red). Related term: Cyber Monday is the first Monday after Thanksgiving when many online retailers give deep discounts for a limited time. Black Friday deals can be previewed on many websites- just search for “black friday” in google. These ads are printed in advance so that they are ready for distribution before the big day. Copies of the ads are smuggled out of the print shops and onto the web. There you go. After last week’s deal on a 2gb flash drive many of you said “I don’t need that much space.” OK- then get while it lasts at Office Depot. 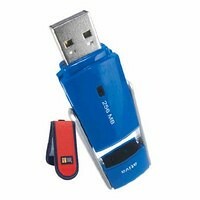 Rebate required and includes a flash drive carrying case.